FORT FRANCES -- Two years ago, when the Chicago Blackhawks won their second NHL championship in three seasons, Duncan Keith wanted to bring the Stanley Cup to Fort Frances. His schedule and exhaustion got in the way. FORT FRANCES -- Two years ago, when the Chicago Blackhawks won their second NHL championship in three seasons, Duncan Keith wanted to bring the Stanley Cup to Fort Frances. His schedule and exhaustion got in the way. This time around, there was no doubt where he’d spend his day with the Cup. On Saturday nearly 2,000 fans flocked to the Memorial Sports Centre, where Keith spent 10 years playing as a youngster before moving to Penticton, B.C., the rink where he made the fateful switch from forward to defence. The two-time Olympic gold medalist, the reigning Conn Smythe Trophy winner, made a grand entrance. The lights off and fans waving red glow sticks and chanting his name, Keith rode in standing tall in the back of a jeep, Lord Stanley’s mug raised to the rafters above his head. “It’s hard not to be pretty humbled to come back and see this kind of event and the amount of people that came back and have come out to it. It’s been incredible and a lot of credit has to go to the people who put this on and did a lot of work behind the scenes,” Keith said in a brief interview before sitting down to sign autographs for hundreds of fans who waited in line, some for several hours, for a chance to meet their hockey hero. The two-time Norris Trophy winner said he knew before he won the Cup for the third time it was headed to the Northwestern Ontario community, a town of nearly 8,000 that straddles the Minnesota border, some 375 kilometres west of Thunder Bay. Keith celebrated with 150 friends and family on Friday in Belair, Man. 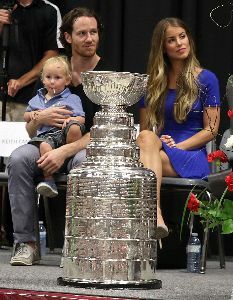 with the Cup, and brought plenty of family, including his mother Jean, father Dave and young son Colton, to the day-long celebration, which also included a stop at a busy Boston Pizza outlet, where young diners were encouraged to pen letters to the Winnipeg-born 32-year-old. For Dave Keith, it was special to see his son share the Stanley Cup with those he grew up with, in a community where the future hall-of-famer's hockey roots originated. “The grounding of their hockey was right here in Fort Frances. When we moved to Penticton, Duncan was aleady a pretty accomplished hockey player,” said Dave Keith, who helped lay the financial foundation for the city’s new rink, Ice For Kids Arena, before moving his family westward. The fans on hand were thrilled for a chance to mix-and-mingle with the Blackhawks legend. The family of Lukas Rudaitis, a 12-year-old from Mississauga, picked a pretty good time to vacation in Fort Frances. It was pretty sweet, he said. “I loved it. It was awesome,” the youngster said. Nicole Poirier and her boyfriend Brian Marshall made the trek from Thunder Bay. “We’re both big Hawks fans and have been for a long time. It’s always a good time to see Keith as well,” she said. Marshall was quick to point out that he’s the Duncan Keith fan in the relationship. Poirier, it seems, prefers Sharp, who this summer was dealt to Dallas. The difference in opinion is not an obstacle to their happiness. “It’s great. Just a fun time to come out with my girlfriend and spend a nice summer weekend together, see Duncan Keith and support the Blackhawks,” Marshall said. Keith told the crowd the next time he's back in Fort Frances, he hopes its to sit in the audience and watch a current youngster celebrating his own day with the Stanley Cup. The Cup will next travel to Lethbridge, Alta., where Kris Versteeg will have his day with the trophy.